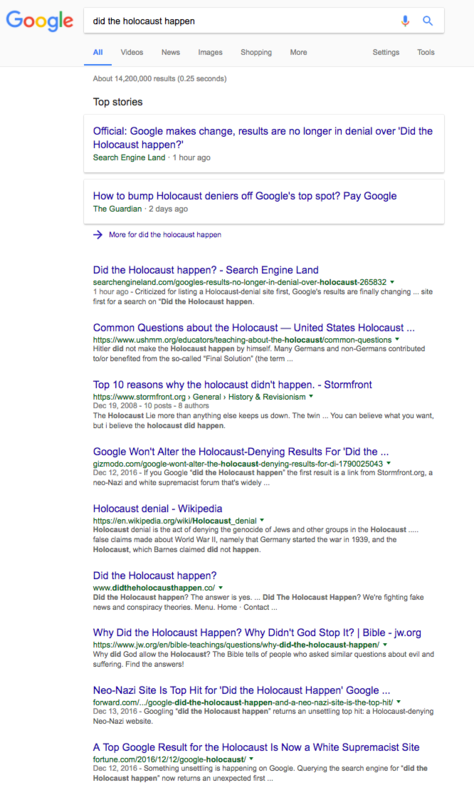 What can an SEO do about Google rankings 'Did the Holocaust Happen? Home > Internet > SEO > What can an SEO do about Google rankings ‘Did the Holocaust Happen? If you have been following, there are a number of people and publications calling out Google for ranking a holocaust denying page at the top of the results for the term; “Did the holocaust happen?”. This started with an article in The Guardian on how Google results are shaping the way people see the world…some people! Read it here, it’s quite interesting. Google is not ‘just’ a platform. It frames, shapes and distorts how we see the world. Still, to this day Google is primarily ranking content based on a number of rules, where they usually don’t alter the way pages are ranked, even in a case like this. But there is something you can do, already described by The Guardian in How to bump Holocaust deniers off Google’s top spot? Pay Google. Slowly, you will see the Google search results changing. Already, the Search Engine Land article is ranking at the top. Related: Is The Holocaust Real?